The torque supplied by the weights attached to the chains of a grandfather clock is necessary to operate the time, strike and chime features. Circular stop-rings installed at the free end of the chains are designed to prevent the chains from falling off their respective sprockets as the weights are lowered during the normal operation of the clock. When these rings are missing from the chain end, the chain may run through and fall off its sprocket. The clock owner can reinstall the chain on the grandfather clock sprocket in one hour with a small amount of tools, materials and clockwork skills. Open the front access door of the grandfather clock. Stop the motion of the pendulum if it is still operating. Use a cotton cloth in-hand to interrupt the movement of the round brass bob at the lower portion of the pendulum. 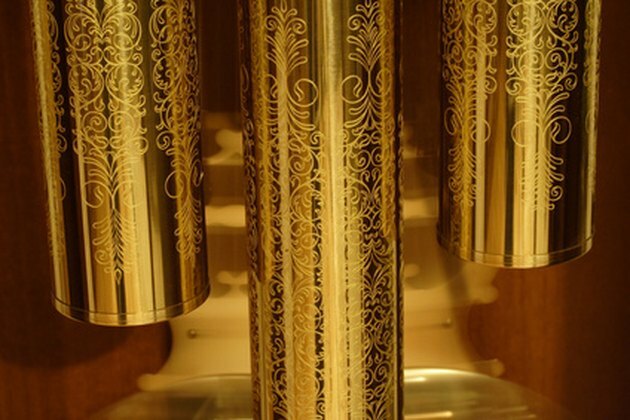 Handle all brass parts of the grandfather clock with the cotton cloth to prevent corrosion to their finish. Remove the weight canisters from the remaining chains and mark the bottom of each with a small piece of masking tape and a marker pen. Mark with an “R” for the right side, “M” for the middle weight and “L” for the left side. Measure the height of one of the weight canisters from top to bottom and record this measurement. Carefully remove the pendulum from the grandfather clock case. Locate the chainless sprocket and use a small flat-tip screwdriver to gently push on one of the sprocket teeth. The sprocket will move in one direction with a ratcheting sound. In the other direction, there will be no movement at all. Fasten a length of small-gauge flexible wire to the last link of the weight chain’s free end using the needle-nose pliers. The free end will be the end without the weight canister hook. Curve the lead end of the flexible wire to accommodate the radius of the sprocket. Pass the curved end of the wire around the sprocket in the direction in which the sprocket will ratchet. Pull the wire slowly until the individual chain links reach and engage the teeth of the sprocket. Continue to pull the chain slowly until the weight canister hook is two inches above the recorded height measurement of the weight canister when the weight canister is resting vertically on the bottom of the clock case. This ensures that the weight canister does not touch the bottom of the clock case when it reaches the lowest portion of its operation. Remove the wire from the chain link it is attached to inside. Install the new clock ring on the chain link nearest the ratchet end of the sprocket. Install the grandfather clock pendulum. Take care not to bend or twist the pendulum after anchoring the pendulum hook into place. Use a cotton cloth to handle all brass parts. Place the weight canisters onto their respective chain hooks using a clean cotton cloth. Remove the masking tape position labels from the bottom of each weight canister. Set the pendulum into motion. Close the front access panel of the grandfather clock.